Voilà. Right before your unbelieving eyes. While on a search-and-rescue mission down in Florida with the Coast Guard, our boat cut through a large school of flying fish. Dozens of silver fish with insect wings flew—flew— just above the surface of the water in every direction. While in Las Vegas, I bought into a craps game with $100. I took the dice in my hand and rolled for :40 minutes without rolling a seven. I was surrounded by high rollers who made tens of thousands of dollars off of my good fortune. When I finally crapped out, a few of them tossed black chips to me as a tip. But I’ve never seen anything more astonishing than the :90 minutes of magic performed by Steve Cohen at the Waldorf Astoria. I’ve seen plenty of magicians over the years. Here in New York. Las Vegas. Atlantic City. Both big and small venues. Penn and Teller. Ricky Jay. Chris Angel. David Blaine. A whole slew of unknowns, too. You tend to see the same tricks performed with slight variations. I don’t mind the repetition as long as they’re executed cleanly and with some panache. I’m a bit of a magic snob, though. It’s become hard to impress me in my old age. 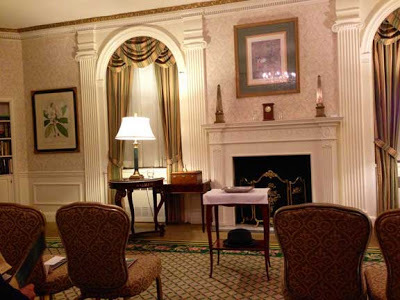 Steve Cohen’s Chamber Magic is an intimate, close-up show performed in a private suite at the Waldorf Astoria (an art deco masterpiece). It’s a quintessential New York City experience that harkens back to an era when people were entertained in their parlors. The audience is small. No children are allowed. In keeping with the surroundings and spirit of the evening, cocktail attire is required. I love close-up magic. With the audience sitting just a few feet away, only the ninja grand masters of misdirection can pull it off. All the tricks in Cohen’s show, save one, were new to me, so the show was remarkably fresh. It’s not padded with a lot of pedestrian, off-the-shelf tricks. There’s no let-up in the pacing. I’d love nothing more than to detail what I saw—or what I thought I saw—but that would be a disservice to Mr. Cohen and any of you who might be lucky enough to see his show. I’ll give you a taste and beg his pardon. If you know how this, or any of his tricks, are executed keep it to yourself. Don’t bother to post it in the comments section. It’ll be deleted unread. I don’t want to know. I NEVER want to know! I can assure you he doesn’t use audience plants because I participated and I’m not a plant. How many times have you seen a magician take three large, silver rings, couple, and then uncouple them? It takes some dexterity but it’s a fairly common trick. Cohen’s version is more complex. He took my wedding ring and rings from two other audience members, dropped them into a wine glass, swirled them around and when he pulled them out they were linked together in a chain. He brought them over to me so I could confirm that it was my ring in the middle, with the other two linked to it. He then held the rings in his fist above the glass. Asked for quiet. We heard a *click* and my ring dropped out of his fist into the glass. He held up the two rings, which were now connected to one another. He held them in in fist, another click and they dropped in, separated. Amazing. And there’s plenty more where that came from, brothers and sisters. I met him after the show. He’s an interesting chap. Fluent in Japanese. Lived in Japan and worked as an interpreter for the Japanese government. He obtained a degree in psychology from Cornell which, he said, helps with his magic. The magic bug bit him at age six when his beloved uncle showed him a few tricks. His audience has included titans of business, politics, entertainment, royalty and, most recently, your humble unbearableness. See that kettle? That’s Think-a-Drink. Guess what it pours? Whatever the hell you tell it to. It defies the laws of time and nature. Needs to be seen to be believed. Twilight on Park Avenue. 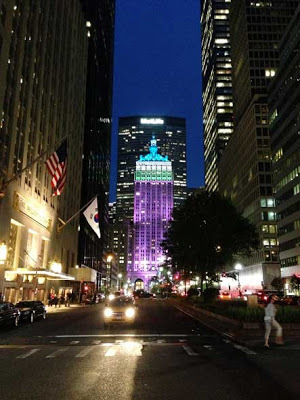 The Waldorf Astoria on the left flying the South Korean flag, the Helmsley Building front and center and MetLife (née Pan Am) behind that. Oh! How wonderful! I am always happy to suspend disbelief for a good magician.Even when I know how it’s done.Thank you,UB, for taking us to magicland. I am an excellent audience. I’m always willing to completely suspend disbelief and buy into whatever the artist is putting out there, be it a film, music, painting, whatever. Especially in the case of magic. I’m all in and don’t want to know how it’s done. Ah, you’ve obviously never seen Paul Daniels, the wig-wearing maestro from Yorkshire. That would have brought you down to earth. Does that kettle pour out stuff without being tilted? I Googled Daniels. A long and illustrious career. Never heard of him but he looks like the real deal. A staunch political conservative. Said David Blaine was “not very original.” I wonder if envy plays into that?The kettle does not pour itself. You tell it what you want to drink and it serves it up. Fascinating. That ring trick sounds absolutely FANTASTIC! I LOVE close-up and personal Magic….I think it is a brave Magician who does this…..And I love that it is at The Waldorf…. !A perfect Evening!! I don’t know how any of it is done and I really believe in the Magic of it all…..! There are some great magicians out in L.A. along with The Magic Castle, a world-renowned hangout for magicians. It’s on my to-do list. Indeed! The Magic Castle is right below me. I live up in the Hills above it—-I have been there any number of times way in the past, when I could still go out into the world—And, in fact, saw a number of wonderful Magicians in a small setting, similar to the one you described. Milt Larson, who is still very involved there, was a close friend of a friend. If you make it out here, I have a very good pal who is on the Board….! And….if you do come to L.A., I could meet you, too! so, how do i get tickets!?!?!? There’s a link in the post. “Steve Cohen’s Chamber Magic“. Fourth paragraph or something like that? Not cheap but not outrageously expensive, either. Jacket and tie for the Mr. Totally worth it. Listen, dear. You’re going to be here for a length of time that will allow you to do BOTH. It’d be a pity to miss out on either activity. I’d like to live in a MAJOR city too! Unfortunately, I’m banished to New Jersey. I’m not complaining, though. At least I get a taste. You’d be shocked at how many people who live in the city never take advantage of it. Never go to a show. Never visit a museum or the observation deck of the Empire State Building. They get too wrapped up in their tiny tide pools and can’t see the ocean. You’re not kidding, brother. And it kind of fell into my lap. It makes me wonder what ELSE is out there that I’m unaware of! Hello, Alice. Welcome to the show. Glad to see you here. Lady blogs are all very nice, but I’m happy to see you spread your wings a bit. A little bit of male perspective can go a long way. Four daughters means you are badly outnumbered. My bride and I prefer a 1:1 ratio. Please spread the Unbearable gospel. I dream of one day having the numbers that Mme. Weebles enjoys. You mean to say you removed your wedding ring?And you didn’t die?The kettle trick I’d love to see -‘specially if one can sample.Smashing photie. I removed my wedding ring, handed it to him, and he made a quip about seeing “K-Mart” inscribed inside. Ha-ha. Re: Think-a-Drink. Whomever was participating in that trick was allowed to sample what came out. The proof is in the tasting! It’s a long road from The Waldorf to Cleveland but you never know. 1) What’s a black chip worth, and2) I thought rolling a seven or an eleven was what you were after, n’est pas?? and finally3) I played craps about a hundred years ago in a Canadian Legion ( totally illegal but what can you do? ) and all I remember was that I put down a twenty, threw the dice about three or four times and then was given the bums rush because they either added up wrong or right or something! I decided then and there, ‘ it just ain’t your game’. 1) 1 black chip = $100. 2) Rolling 7 or 11 is a winner at the start of the game (the come-out roll). Once you establish a point, the game is to roll the point BEFORE rolling a 7. For instance, if you roll a 5 on the come-out roll, that becomes the point. Roll another 5 before rolling a 7 = winner! Rolling a 7 before hitting the point = good-bye twenty. See?3) Do not play craps. Nothing good can come from it. Well that’s as clear as mud, as my sainted Father used to say. So if you roll a five on the come-out roll and you avoid the seven for the next twenty rolls but you roll all kinds of other numbers, you’re winning or losing or just hanging onto the dice or are you waiting for another five?I feel the darkness drawing in, Mother, are you there? If all you have your money on is the point (in this example, the five) then you’re just hanging out throwing numbers until either a five or a seven comes up. Don’t get me started on all the side and proposition bets you can place in the meantime. I’ll be here all night. There’s a lot to enjoy in this one UB. I like the idea of private (or small, intimate) musical experiences. Democracy is sometimes inimicabale to musical enjoyments, I find. People should treat music with some respect, and they should take the time to learn the codes of behaviour. It’s not about snobbery–it’s precisely the opposite: making the event enjoyable and special for everyone. It’s a really unique environment, but it’s not the only small venue to see a magic act in Manhattan. There’s another one down in Greenwich Village that has a magic show every Monday night. Small audience but sometimes cheesy acts. I need that kettle!The whole show sounds fantastic, I hope he’s delighted with your review, because if he ever comes to the UK I’ll definitely go and see him. I know he travels but I don’t think on a regular basis. Check his web site. Once more reason for you to visit NYC! We saw Steve Cohen too, he’s amazing, isn’t he? That teapot thing blew me away. He poured a margarita, orange juice, and a Coke! I’ve seen a bunch of magicians/illusionists/mentalists/whatever as well, but this was really different. 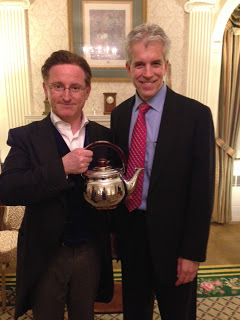 So I went home and tried to pour a martini from my own teapot. It didn’t work. At first I was encouraged because a clear liquid came out but it was just water. Disappointing. No way! You saw him too!? That’s fantastic. We’re practically related, you and I. I have a small inkling of how he performs the teapot trick but will keep it to myself.